I’ve been somewhat restless this year… looking at my wordpress dashboard, I have no less than 19 posts sitting in the ‘draft’ queue. There’s so much more I want to write about, and yet it seems like these days I can only get two thirds of an article written before I run out of energy or inclination. I guess a 45 hour week will do that to you. I’ve been studying game systems and the art boss design with intense interest this year. One of the limitations of making turning Max Payne into a fighting/adventure game has been that fights always come across a little underwhelming. All of the characters are regular bipeds, and they share the same movements due to the enormous amount of time and effort animation takes up. It takes a lot of work to prevent these fights from getting repetitive. Even in the regular Max Payne games (1 and 2), the weakest aspects are the boss fights because they either boil down to basic shootouts, or elaborate stage puzzles. This week I realised that the reason the boss fight I was designing fell flat is because there’s no payoff for actually beating the bad guy. In Katana, when you defeat The Big Bad – your reward is crude but satisfying: – the music intensifies; blood and light particles flood the screen; and your character echos “Wuuoooaarhh!! !” as he tears his adversary’s head off in slow motion with his sword. All of this happens in about 3 seconds. A fitting, and brutally honest end to a game is entirely focused around violent, bloody confrontations. It is called Katana, after all. Whereas in this fight I’m working on… it’s a bit of strange one because the conflict is optional. The whole premise is that the player character is starting to believe in their inner strength and chooses to fight the big bad boss, even though they don’t have to. In game terms, that means that the player should also want to choose to fight, because it’s fun; but if they want to, they can actually run away and load the next level. This boss is intentionally tougher than anything they’ve faced before, so assuming they choose to fight on, I’ve added another shortcut — ring outs. The setting is a small subway, and the player can lure the boss onto the tracks, wait for a train, and then jump to safety at the last moment. The boss is scripted to try and climb back onto the platform, but most of the time he still gets hit. Of course, the player can also get splattered by the train, so there is some risk involved. So, I think all that stuff is okay, but what happens for the players who do take the time to beat this boss properly? He just yells “Yarrrgh…!”, keels over, and vanishes. Until this week, I’d not given it that much thought, but I had an underline sense that it just felt wrong. For stylistic reasons, I can’t have the player decapitate him or have him explode (the game is not gory at all); but I wanted to visually reward players for winning the fight. Then it occurred to me — why not make it like a Mortal Kombat stage fatality? I mean, sure it’s cheesy, but the train is already there. So, after you ‘win’ the fight, the boss staggers to his feet, precariously near the edge of the platform. I must stress that the player can still choose to run away at this point. It’s a very simple set up that guarantees that the train will suddenly appear and hit the character if the player chooses to kick or punch them off the platform. This means the player can run up to the guy and perform their own custom juggle combo on the boss – really lay into them, and then cap it off with a cool stage finisher. It’s not quite finished, but already the level feels more complete after this addition. It occurs to me that not enough games outside of the fighting genre actually let the player beat up the boss after they’ve won. And why the hell not? Bosses are, by definition, challenging and borderline frustrating, so it makes sense to reward the player once they’ve overcome them. Yet, off the top of my head, I can’t think of a single recent game that lets you ‘finish’ a boss. Bayonetta perhaps? Even if the fight itself is solid, too many games these days retreat into a cutscene or quicktime event the moment that the boss hits zero HP. It’s a real shame, because the idea of allowing the player to ‘Finish’ his opponent in style is a stroke of genius. Say what you will about Mortal Kombat’s exaggerated violence and gore, Ed Boon and his team really understand the idea of overcoming adversity “in an honest and visually unique way”. It’s about understanding your characters, something which MK has always excelled in — whether it’s Sub Zero with his deep freezing powers, Scorpion with his harpoon spear, Raiden with his electricity, or Kung Lao with his razor sharp hat. All of these characters are instantly identifiable, and their finishing moves are appealing because they fully utilise the uniqueness of the character and their powers. I can’t say I’m a huge fan of the DC universe, but who wouldn’t want to play as Superman when you can uppercut your opponent OUT OF THE EARTH’S ATMOSPHERE. Getting back to finishing moves, besides being visually striking, the most important thing is that they are interactive. They can only be performed if you win the match. You can choose between 2-4 unique moves per character, and some levels offer special stage finishers. You have about 5-10 seconds to enter the correct input. You have to be standing in the correct place for it to trigger correctly. The key point to take from that list is choice. We’re not talking about a glorified quicktime event, where the player presses buttons in sequence as cool stuff happens. And we’re not talking about violence for the sake of violence. The point is that the player can choose exactly how they want to finish their adversary – even if that choice means running away or letting them go. In this scene, the player character backs a defeated, unarmed soldier to the wall, and is then prompted to kill him. All the while, the man is begging for his life. It could have been quite thought provoking, adding a level of ambiguity to the character, and making a brave point about thoughtless killing in promoted in videogames. Instead, it’s unsettling — and for the wrong reasons. 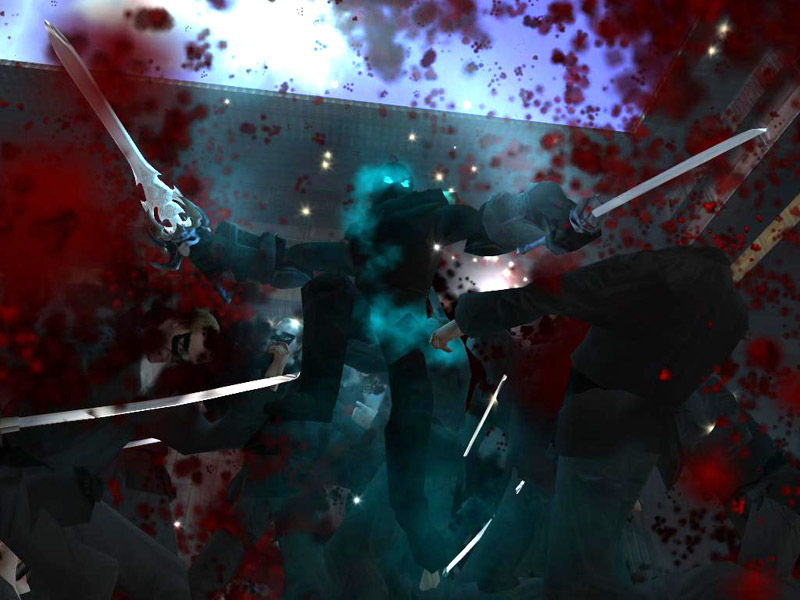 As the reviewer points out – “the player has no choice but to run him through, in slow motion.” In his dying breath, the soldier reprimands the player for being inhuman. This is a design mistake. If you’re going to have your character commit a morally ambiguous action, you either don’t make it interactive, or you let the player choose and accept the consequences. Forcing the player to participate in an action they morally disagree with only serves to alienate them from the character and the game as a whole. It’s subtle, but you have about ten seconds to decide whether or not to pull the trigger. The game doesn’t judge your decision. Meaningful choice is important because humans are problem solving machines. When confronted with a problem, we make a choice and take action based on it. We then analyse the consequences of that action (rewards and punishments); we consider the alternative choices that could have been made; we weigh these factors up and we determine whether or not we made a mistake. Through this process of trial and error, we learn from our mistakes, and when confronted with similar problems, we apply this learning to make more informed decisions. As we become more knowledgeable and experienced, we start to make less mistakes and gain a sense of accomplishment. We then seek more challenging problems, so we can further our learning, and inch closer towards mastery. However, if you take choice away entirely, then you short-circuit the whole learning cycle. Without choice, you can’t make a mistake, and without mistakes you can’t really learn. Your actions become meaningless events with no significant consequence. In the simplest terms: if learning equates to fun, then removing choice kills the fun in your game (although remember that overchoice can overwhelm players — everything in moderation, as always). On the other hand, introducing subtle tactical and strategic choices can make a basic game system more refined and interesting. For instance, even when God of War uses quicktime prompts, many of them are optional and have different strengths and weaknesses. Usually performing a quicktime finisher lets you defeat the enemy early (when they have 20% – 33% health left), makes you invincible during the animation, and it rewards you with a health or magic bonus. In other words, these finishing moves give you an immediate, tactical advantage, as well as a visually strong way to defeat your opponents. However, if you beat the enemy with regular attacks (slightly more challenging), you’re rewarded with more orbs — the game’s currency, which lets you purchase upgrades. This gives skilful players a long term, strategic advantage. This means that during almost every single encounter, the player can choose between a tactical vs. strategic approach, depending on their current situation, and their goals and motivation. But it’s not required of them — there is an optimal path, but they’re not forced to play it. This adds subtle layer of depth to the game, without ever over complicating it. In closing, when designing games and levels, I think it can be helpful to think of “the player as the director”. Always remember that when the game starts, when someone calls “Action!” (or “Finish him!”), it’s the player who fulfils the role of both the lead actor and the director on set. While it’s tempting to push them down the best possible path, ultimately it’s their story, and when it comes to the big set pieces, they should be the ones who control how the action unfolds. Do they viciously finish their adversaries, or do they just walk away? That should be their decision. Your job is to give them the opportunity to decide.